Karimnagar derives its name from Syed Karimuddin, a Quiladar, and is known as a centre for Vedic learning from ancient times. The river Godavari adds to the beauty of the place. Karimnagar is home to many tribes such as Gonds, Koyas, Chenchus all living in their own settlements & speaking their own dialects. The locals specialize in silver filigree work, which is a very delicate form of metal craft. Rail: Karimnagar is located 158 km from Hyderabad and is well connected by Rail. Road: Karimnagar is located 158 km from Hyderabad and is well connected by Road. Nagunur Fort: This fort ramparts wee once alive with the sounds of bustling town and people of the Kakatiya Empire. The fort is testimony to the imperial powers of the Kakatiyas; it was one of the most important forts of the emerging Kakatiya Empire and contains ruins of a cluster of Kalyana & Kakathiya temples. The pillars and galleries around the Shiva temple here are worth seeing. The most important temple in the complex is the Shiva temple, which has three shrines. Eligandal Quila: Located 10 km from Karimnagar, Eligandal was once the capital of Telangana. The Kaktiyas, Bahmani’s Qutub Shahis, Moghuls and Asif Jahi’s build the fort on a hill, which was ruled. A mosque in the fort built by Zafar-ud-dowala in 1754 AD. Have minarets, which oscillate when shaken. Tombs of several Muslim saints exist here. On the 11th and 12th day of Moharram an annu7al Urs is celebrated in honour of these muslin saints. Other places of interest are temples dedicated to Neelakantha Swamy and Narsimha Swamy. Dhulikatta: 20 kms from Karimnagar is Dhulkatta an important Buddhist spot visited by monks from all over the world. Many Buddhist stupas; of the Satavahana period are fond here. The 3-days Satavahana festival is conducted in the month of January every year. Molangoor Quilla Fort: 30 km from Karimnagar, strategically located on summit of a big isolated granite hill, the Kakathiyas built this fort. The ruins of palaces, garrisons, stables and other structures stand as mute witnesses to the valour and pride of the fort. Kondagattu: About 35 km from Karimnagar is this breathtaking temple of Lord Anjaneya Swamy. Situated amidst hills, valleys and water springs Kondagattu is blessed by nature and very scenic. According to the folklore, a cowherd constructed the temple some 300 years ago. Krishna Rao Deshmukh has built the present day temple 160 years ago. It is believed that if women offer Puja for 40 days at this temple then she will be blessed with a child. Apart from the temple, the fort of Kondalaraya and Bojjpotana cave are worth seeing at Kondagattu. Vemulawada Rajarajeshware Temple: Located 38 km from Karimnagar, at Vemulawada is the famous temple dedicated to Lord Rajarajeshwara swamy, which draws pilgrims from far. Built by Chaluka Kings between the 750 AD & 973 A.D. the complex houses several temples dedicated to deities like Sri Rama, Lakshmana, Goddess Lakshmi, Ganapathy and Lord Padmanabha Swamy. Manthani: Manthani, 70 km from Karimnagar is situated on the banks or river Godavari. This is a very ancient centre of Vedic learning and even today there are many scholars well versed in Vedas & Sastras. Among several temples situated here the important ones are of Lord Saileshwara, Laxminarayana Swamy. 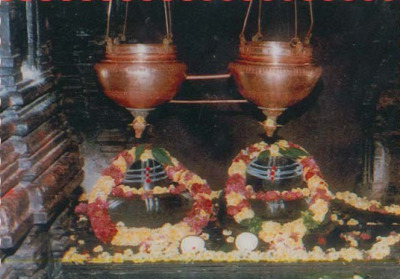 Omkeshwara Swamy and Mahalaxmi. It is also a main centre for Jainism & Buddhism. Raikal: Located 75 km from Karimnagar the ancient temple of Kesavanatha Swamy is situated here, built in the 11th century A.D. by the Kakatiyas the temple has beautiful sculptures. Another interesting temple is that of Panchamukhalingeshwara Swamy (Lord Shiva with five faces) which is believed to be one of the only two existing, the other being at Kasi. Besides there is a temple of Bhimanna in whose honour an annual Yatra is held for 3 days during January to February. Dharmapuri: On the banks of River Godavari, 78 km from Karimnagar, is the 15th century temple town of Dharmapuri. According to the legend king Bali Verma performed the Dharma Devta Yagna. He wanted all his people to follow and live according to Dharma. Hence this village got its name as Dharmapuri. It was an ancient seat of learning languages, Literature, dance and music. Among the prominent temples in the town are the 13th century Sri Lakshmi Narsimha Swamy temple, Sri Venkateshwara Swamy temple, Sri Ramallingeshwara Swamy temple where Shiva & Vishnu temples exist side by side. River Godavari adds to the scenic splendour. The Shivaram wildlife Sanctuary: Located 10 km from Manthani, 80 km from Karimnagar & 50 km from Mancherial is the Shivaram wildlife sanctuary. This 37 sq. km riverine forest mixed with teak & terminalia is home to Marsh Crocodiles of river Godavari. It also harbors Panthers, Sloth Bears, Nilgai, Black Buck, Cheetal, and Python & Languor. Kaleshwaram: This picturesque spot, surrounded by thick forests is located 130 km from Kaarimnagar, 32 km from Manthani and lies on the confluence of the River Pranahitha and the River Godavari. The ancient temple dedicated to Mukteshwara Swamy is of special significance as two Shivalinga’s are found on a single pedestal. Besides several temples situated here the one dedicated to Brahma is rather uncommon. This entry was posted in Andhra Pradesh, Karimnagar and tagged Dharmapuri, Dhulikatta, Eligandal Quila, Kaleshwaram, karimnagar tourism, karimnagar tourist places, Kondagattu, Manthani, Molangoor Quilla Fort, Nagunur Fort, Raikal, The Shivaram wildlife Sanctuary, Vemulawada Rajarajeshware Temple. Bookmark the permalink.